Spring Training is a few weeks away and that means we’re in top 100 season. Baseball America released their annual top 100 prospects list earlier this week, and a few days ago, Keith Law published his top 100 list as well (1-50, 51-100, just missed). It’s all behind the Insider paywall. Athletics SS Jorge Mateo (No. 39) and RHP James Kaprielian (No. 56) both made the top 100 as well. They went to the A’s in the Sonny Gray trade. As a reminder, OF Clint Frazier exceeded the 130 at-bat rookie limit by four at-bats last season, so he is no longer rookie (or prospect) eligible. He would’ve surely made Law’s (and Baseball America’s) top 100 lists had he still been eligible. Anyway, I have some thoughts on Law’s list and the Yankees’ top prospects in general. 1. Let’s talk about Gleyber’s power. There’s a difference of opinion about Torres’ power these days. Law’s write-up says Torres projects to “probably just 10-15 homers a year,” which is below-average pop. Especially these days with the juiced ball. Baseball America and MLB.com both slap a 55 on Gleyber’s future power, which is a tick above-average on the 20-80 scouting scale. Generally speaking, 55 power projects to about 18-22 homers per season. Maybe a little more in this homer happy era. Either way, Law is lower on Torres’ long-term power than Baseball America or MLB.com, which doesn’t mean one or the other is wrong. They could both be wrong! It just means there’s a difference of opinion. In his limited time last season Torres hit seven homers in 235 plate appearances as a 20-year-old in Double-A and Triple-A, which is damn impressive. These days it seems like young players are coming up and hitting for more power than expected almost instantly, and it’s not just the Gary Sanchezes and Cody Bellingers and Aaron Judges. Guys like Tyler Naquin came up and started smacking homers. Based on that and the whole Yankee Stadium thing, I’d take the over on 10-15 homers annually from Gleyber. 2. Setting the record straight on Andujar’s defense. The Yankees opted to keep Andujar in Triple-A during the second half last year to work on his defense even though they needed another bat and had an opening at DH. There was a clear path to regular big league playing time. Instead, the Yankees left Andujar in Triple-A so he could work on his defense in games that don’t count. That seems to have created the narrative that Andujar is bad in the field. That’s not true. He’s not Brooks Robinson, but he’s a fine third baseman. “He has a rifle of an arm and has improved his footwork to the point that he should be an average defender at third,” wrote Law. 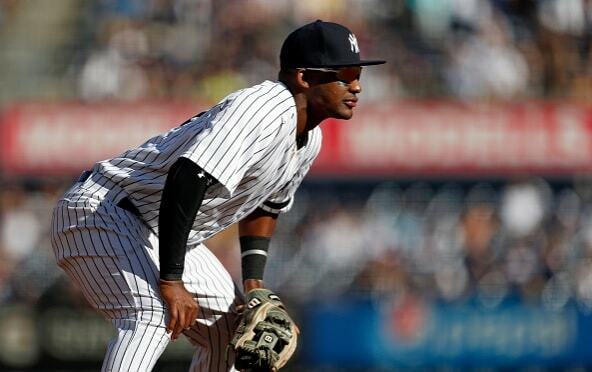 More than anything, the Yankees kept Andujar down to correct some bad habits in the field. He tends to show off his arm, which robs him of accuracy, and there are times he’ll rush and let the ball play him. Andujar’s defensive tools are fine. He has plenty of arm and he has the quick twitch reactions needed for the hot corner. He just needs to iron some things out. This isn’t like Marcus Thames playing third base. The Yankees aren’t forcing something that obviously won’t work. 3. Perez has at least one big fan. I’m pretty sure you’re not going to see Freicer Perez on another top 100 list this spring. Law calls him a “potential front-line starter” who “pitches at 94-98 now and shows a plus curveball and projectable slider along with a changeup that he’s still learning to use.” I haven’t seen a report that glowing basically anywhere. Everything I’ve heard and read says Perez’s secondary pitches are still iffy. It’s possible Law caught him on a good day(s) and/or received favorable reports. If someone saw it though, it’s in there, and it’s a matter of getting to it consistently. Pretty much every tall Yankees pitching prospect — Perez is 6-foot-8 — gets compared to Dellin Betances at some point, though that’s unfair. When one of these guys goes out to the mound with 98+ and that breaking ball, we can talk about the Dellin comparison. Let’s let Freicer Perez be Freicer Perez. Law’s scouting report is glowing, and there’s no doubt Perez is a quality prospect even if you aren’t this high on him. Not too bad for a kid who signed for $10,000 back in the day. 4. Let’s talk about who is not on the top 100. Florial is going to be a top 100 prospect pretty much everywhere else and the same is probably true for Chance Adams as well. I’m not a big Adams guy — I think he’s probably a reliever long-term (a good reliever, I should add) because his fastball is true and he’s been unable to prevent upper level hitters from getting the ball airborne (41.4% grounders in Triple-A last year) — and I wouldn’t have him in my personal top 100 list, so I don’t have a problem with Law excluding him. As for Florial, Law explains it’s all about pitch recognition. “On raw tools, Florial would go somewhere in the top half of the list. Maybe in the top 25 … His pitch recognition, however, is a huge problem … in large part because he does not seem to recognize changing speeds at all,” says the write-up. Last year’s 31.1% strikeout rate — it was 35.8% against mostly Double-A caliber and above pitchers in the Arizona Fall League — doesn’t lie. The kid is super talented, but he has some holes in his swing and issues with breaking balls. The Yankees love Florial and expect him to get better as he gains experience after not playing a ton as an amateur. Until he gets better though, he’ll be a very high risk prospect. High reward! But also high risk. And besides, Law’s lists always seem to generate a ton of outrage no matter what. The focus is on Florial not making the top 100 rather than Perez making it, or Sheffield ranking way higher than he’ll rank anywhere else, or Acevedo being a borderline top 100 guy. If the Yankees get their way, they will go into Spring Training with six viable big league starters for five rotation spots. They’ve been trying to add a starter to a group that already includes Luis Severino, CC Sabathia, Masahiro Tanaka, Sonny Gray, and Jordan Montgomery. And not just a depth arm, either. They’ve been after guys like Gerrit Cole, Michael Fulmer, and Chris Archer. The Yankees want impact. Of course, even if the Yankees get that impact pitcher, they’re probably going to end up using more than six starters this coming season. That’s baseball. Last season the Yankees used eleven different starting pitchers, right at the MLB average of 11.6 starters. The last team to use as few as six starters in a single season is the 2013 Tigers. The 2003 Mariners are the last team to get through a season using only five starters. Think we’ll ever see that again? Being able to stash two +1 WAR pitchers in Triple-A for emergencies is a pretty nice luxury. (I’m higher on Cessa than basically everyone, so I think it’s more like three +1 WAR pitchers in Triple-A, but ZiPS says what ZiPS says.) Lots of teams will go into the new season with a +1 WAR guy slated to be their fifth starter, hoping they won’t have to dip into the replacement level fodder sitting in the minors. Teams do not base their rotation depth charts on ZiPS, however. Real live depth charts are based not only on the team’s internal statistical projections — yes, teams develop their own projections — but also scouting reports, development goals, and the 40-man roster. Oftentimes the spot starter decision will be made for the team. Who lines up to pitch that day? Okay, well, he’s getting the ball then. It happens all the time. A few thoughts on the rotation depth chart. 1. Do the Yankees consider Adams ready? Last season, they did not. At least not enough to justify putting him on the 40-man roster two years earlier than necessary. The Yankees wanted Adams to meet some developmental goals in the minors before bringing him to the Bronx, which is why those midseason spot starts when to Cessa and Bryan Mitchell and whoever else. Adams put in close to a full season at Triple-A last year, and he did well superficially: 2.89 ERA (3.76 FIP) with 22.3% strikeouts and 9.3% walks in 115.1 innings. Those numbers usually do not tell the entire story, however. The Yankees may want Adams to, say, improve his changeup. Or get more comfortable pitching lefties inside. Or do a better job locating his fastball from the stretch. That sorta stuff determines MLB readiness more than stats. I expected Adams to make his MLB debut last season, and if you’d have told me in March he wouldn’t, I would’ve assumed an injury was involved. Instead, the Yankees wanted Adams to continue working on some things in Triple-A. Has he improved enough to get the call this year? If not, how long until that happens, assuming he isn’t traded before Opening Day? When it comes to Adams being an MLB option, the numbers tell one story. The Yankees’ actions tell another. 2. Acevedo and Sheffield aren’t rotation options yet. Unless the Yankees manage to get to August or even September without needing their eighth or ninth starter, I don’t think Acevedo and Sheffield are really eighth and ninth on the depth chart, as ZiPS suggests. Acevedo made two Triple-A starts last year and spent most of the summer in Double-A. Sheffield spent the season at Double-A and missed several weeks with an oblique injury. Based on the Adams (and Severino and Montgomery) precedent, both Acevedo and Sheffield are going to get Triple-A time before the Yankees are ready to bring them to the show. Acevedo is on the 40-man roster, so perhaps he gets called up as a shuttle arm or emergency starter or something, but I think the plan is to give him a bunch of innings in Triple-A so he can continue working on his breaking ball and command. Sheffield isn’t on the 40-man and has yet to throw even 130 innings in a season. The Yankees will stick to their development plan with him. It’ll probably be a few months before these two are realistic big league options. 3. Like it or not, Cessa is going to keep getting chances. Like I said, I’m a Cessa fan. I like his velocity, his array of secondary pitches, and his athleticism. Does that mean I think he’ll be an impact starter? Of course not. I think the tools are there for him to be a solid fourth starter, the kinda guy who gets about $10M a year in free agency. At the same time, I know I am in the minority. Cessa has a 4.49 ERA (5.58 FIP) in 106.1 MLB innings, so yeah. Clearly, there’s something the Yankees like about Cessa, because he keeps getting chances. He joined the rotation late in 2016 after Nathan Eovaldi got hurt, and he drew spot starts last year when Sabathia’s knee acted up. Cessa can start, he can relieve, and he’s on the 40-man and optionable. Maybe the Yankees don’t like him as much as me. They probably don’t. But Cessa is a viable depth arm and he’s only 25, so the Yankees are going to continue giving him opportunities to see if something clicks. Maybe it clicks in relief, ultimately. Either way, I think Cessa is the de facto sixth starter right now, regardless of the ZiPS projections. 4. Mystery starters are coming. Who had Caleb Smith making starts at midseason last year? Or Cessa and Chad Green two years ago? Or Chase Whitley in 2014? These unexpected call-ups happen all the time and for all different reasons. Smith was having an exceptional Triple-A season and impressed enough in a long relief outing to get a start. 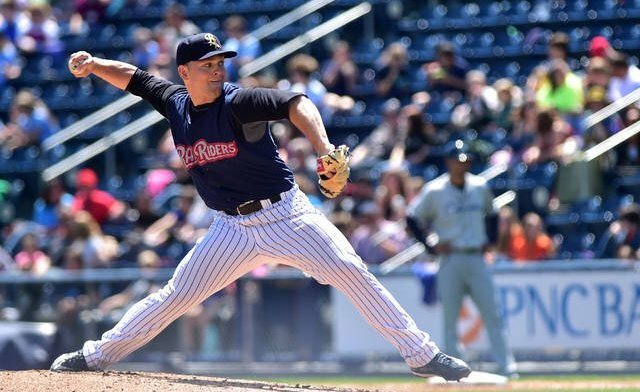 Green was throwing the snot out of the ball for the RailRiders two years ago. Whitley handled the reliever-to-starter conversion better than anyone expected. These surprise starters come with the territory during a long 162-game season. Who will be the random minor leaguer who ends up making some starts this summer? My money is on Brady Lail, but don’t sleep on Nestor Cortes. He’ll be in camp as a Rule 5 Draft pick with the Orioles, though if he comes back, he could get a look. That’s basically what happened with Smith last year. He was a Rule 5 Draft guy with the Cubs, came back to the Yankees, then got called up. Point is, we can put together this carefully thought out rotation depth chart, then some random minor leaguer will barf all over it. Rotation depth tends to disappear quickly. As soon as you think you have it, you don’t. Guys get hurt, guys underperform, things never go according to plan. That’s why the Yankees are looking to add a high-end starter. The more the better. I have some concerns about the current rotation given last year’s workloads, but I’m also comfortable with Cessa and German as the sixth and seventh starters, especially with Adams waiting behind them. At the same time, if the Yankees want to add more arms for depth, I am all for it. Now that we’re a month into the offseason, Baseball America has started their annual look at the top ten prospects in each farm system. They hit on the Yankees yesterday. The list and system overview is free for all. The scouting reports and the chat are not, however. They’re behind the paywall. Quick reminder: OF Clint Frazier is no longer prospect eligible. That’s why he’s not in the top ten. He exceeded the rookie limit by four at-bats this year. Anyway, nice to see my main man Thairo get some top ten love. It’s been fun to watch him climb from sleeper to 40-man roster player. I have some thoughts on the top ten, so let’s get to them. 1. This is a pitching system now. I mentioned this as part of the Baseball Prospectus top ten write-up and it is worth repeating. The Yankees are loaded with pitching now. A year ago at this time they were a position player heavy farm system and hey, that’s great. I’d rather build around bats long-term than arms. Now though, the farm system is full of power pitchers. Six of the top ten prospects are pitchers, and among the pitchers who didn’t make the top ten are RHP Domingo German, RHP Jonathan Loaisiga, RHP Freicer Perez, RHP Matt Sauer, RHP Clarke Schmidt, RHP Dillon Tate, and RHP Taylor Widener. When those dudes are not among the six best pitching prospects in your farm system, you are packed to the gills with pitching. Inevitably many of these guys will get hurt or flame out, but when you have as many quality arms as the Yankees, your chances of landing some long-term keepers is quite high. 2. Guzman’s velocity is super elite. It’ll be a year or two before the Yankees get some impact from the Brian McCann trade, but so far things are looking good. Both Abreu and Guzman are among their top ten prospects, and, according to the Baseball America scouting report, Guzman “averaged 99 mph with his four-seamer in 2017 and just a tick less with his two-seamer.” That is pretty insane. Among qualified pitchers, Luis Severino led MLB with a 97.8 mph average fastball velocity this year. Guzman averaged 99 mph, prompting J.J. Cooper to say he “has a strong argument that he’s the hardest-throwing starting pitcher in baseball.” There is more to pitching than fastball velocity, of course, but the various scouting reports say Guzman made big strides with his secondary stuff and his command this year, so he’s starting to figure some things out. He’s not going to average 99 mph forever because no one does, but he’s starting from such a high baseline that even after losing some velocity in the coming years, he’ll sit mid-90s no problem. 3. Spin rate is a thing in the minors now too. I wrote a little bit about spin rate last week, and while it is still a relatively new concept to fans and analysts, it’s been a thing within baseball for a while now. The Baseball America scouting report mentions Medina has a “high-spin curveball,” and in the chat, Josh Norris notes RHP Deivi Garcia has a “hook that measures at 3,000 RPMs.” Only three big leaguers topped 3,000 rpm with their curveballs this season, for reference (min. 100 curveballs). RHP Drew Finley (curveball) and RHP Nolan Martinez (fastball) both earned notoriety for their spin rates as draft prospects. As I’ve said, spin rate is like velocity in that it’s only one tool in the shed, it’s not everything, but clearly it is something teams — the Yankees, specifically — target nowadays. The general belief is that spin is not really teachable. It’s either in your wrist or it’s not. The Yankees aren’t just hoarding pitching prospects. They’re hoarding high-spin prospects, the guys who are now very in demand at the big league level. That’s Gilliam in high school in 2014 on the left (video) and Gilliam with Low-A Charleston in 2017 on the right (video). I did my best to grab each image at the moment Gilliam begins to lift his front foot as part of his leg kick. Two things stand out. One, Gilliam has a wider base underneath him now. His legs are further apart. I suppose that could just be a camera angle issue, however. And two, his hands are much lower now. There’s no funny camerawork there. His hands used to be way up near to head and now they’re down by his chest, so yes, he has made some adjustments, at least to his right-handed swing. (There isn’t much old video of his left-handed swing, weirdly.) Anyway, Gilliam had a real nice season, and is one of those quality under-the-radar prospects that makes the system so deep. 5. So apparently Wade’s stock has dropped. Although he did not eclipse the 130 at-bat rookie limit this year, SS Tyler Wade is no longer rookie eligible because he accrued too much service time this season. Baseball America does not, however, consider service time when ranking prospects, so Wade is still prospect eligible. And yet, he’s not in the top ten. In the chat, Norris said Wade “did not come close to (making) this list” even though “he still has a big league future … probably as a utility infielder.” I like Wade. Have for a long time. I like the athleticism, the speed, the defense, and the strike zone knowledge. He just hit .310/.382/.460 (136 wRC+) with seven homers and 26 steals (in 31 attempts) in 85 Triple-A games as a 22-year-old. That’s really good! I know Wade stunk in the big leagues, but he had 63 plate appearances in 81 days of service time. The kid never played. Last year Aaron Judge got called up, struggled in his brief MLB debut, then tumbled down the prospect rankings. Baseball America ranked Judge as the sixth best prospect in the system coming into this season, behind SS Jorge Mateo (who didn’t hit) and RHP James Kaprielian (who was hurt all last year). Now Wade rips up Triple-A, struggles in an insignificant amount of big league playing time, and now he “did not come close” to ranking in the top ten prospects. Eh. I know I’m the high man on Wade, but if he’s not close to the top ten prospects, the system is even deeper than I realized. Monday night was the deadline for teams to set their 40-man roster for the Rule 5 Draft, and, as expected, the Yankees added top prospect SS Gleyber Torres to the 40-man. Also added were RHP Albert Abreu, RHP Domingo Acevedo, IF Thairo Estrada, RHP Jonathan Loaisiga, and OF Billy McKinney. The 40-man roster is now completely full. Garrett Cooper, Caleb Smith, Nick Rumbelow, and Ronald Herrera were all traded away in recent days to clear space. Torres, 21 next month, is currently rehabbing from Tommy John surgery on his non-throwing elbow, and is expected to be ready in time for Spring Training. He came over from the Cubs in the Aroldis Chapman trade and hit .287/.383/.480 (141 wRC+) in 55 games between Double-A and Triple-A this season. MLB.com currently ranks Torres as the best prospect in baseball. Protecting him from the Rule 5 Draft was a no-brainer. The 22-year-old Abreu is the second best prospect added to the 40-man, at least in my opinion. He came over from the Astros in the Brian McCann trade. Abreu had a 3.37 ERA (3.12 FIP) with 27.6% strikeouts and 8.1% walks in 53.1 Single-A innings around elbow and lat injuries this year. He then went to the Arizona Fall League and threw 27.2 innings with a 2.60 ERA in six starts. Great finish to the season, that was. McKinney, 23, is a former first round pick who went from the Athletics to the Cubs (Jeff Samardzija trade), then from the Cubs to the Yankees (Chapman trade). He bounced back in a big way this season, hitting .277/.338/.483 (124 wRC+) with career high 16 homers in 124 games split between Double-A and Triple-A. The Yankees had McKinney start learning first base in the Arizona Fall League to increase his versatility. We heard he’d be added to the 40-man a few weeks ago. The 21-year-old Estrada is a personal favorite, and he had a breakthrough with Double-A Trenton this season, hitting .301/.353/.392 (107 wRC+) with a tiny 10.3% strikeout rate. He’s a good defensive shortstop who also has a lot of experience at second and third bases. Guys with good bat-to-ball skills and strong defensive chops on the middle infield are worth keeping around. The Yankees added a lot of talent to the 40-man today, but don’t sleep on Thairo. Kid can play. Acevedo, the prospect who goes by Big Sunday, threw 133 innings with a 3.25 ERA (3.25 FIP) with 26.0% strikeouts and 6.0% walks at three levels this season. The 23-year-old is one of the more divisive prospects in the system. On some days Acevedo will look like a future ace and on others he’ll look like a middle reliever with little more than a big fastball. It’s worth keeping him around to see how he develops, for sure. Loaisiga, 23, is a lottery ticket the Yankees picked up a few years ago, after he had been released by the Giants. Loaisiga had Tommy John surgery last year, returned this year, and threw 32.2 innings with a 1.38 ERA (2.17 FIP) in the various short season leagues. Johnny Lasagna has been getting talked up as a breakout prospect in recent weeks, and these days rebuilding teams have no problem popping low minors kids in the Rule 5 Draft and stashing them on the roster all year. That’s what the Padres did with Luis Torrens last year. 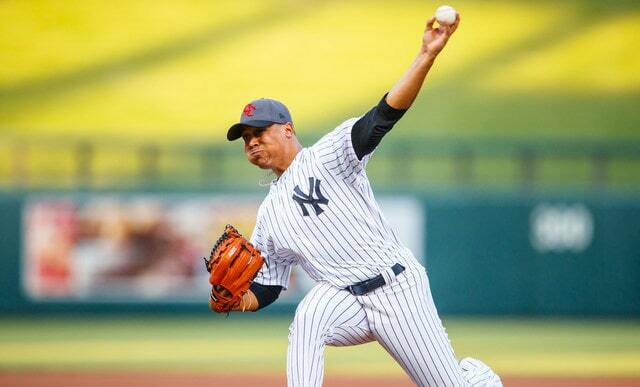 Among the notable prospects the Yankees are leaving exposed to the Rule 5 Draft are IF Abi Avelino, LHP Nestor Cortes, OF Rashad Crawford, RHP J.P. Feyereisen, 1B Mike Ford, RHP Anyelo Gomez, RHP Brady Lail, OF Alex Palma, and LHP Stephen Tarpley. I suspect Cortes and Gomez will get selected in the Rule 5 Draft. Feyereisen and Tarpley are candidates to get picked. As a reminder, players selected in the Rule 5 Draft must remain on their new team’s 25-man active big league roster all of next season, or be placed on waivers and offered back to the Yankees. Most Rule 5 Draft players do not stick. The Yankees lost four players in the Rule 5 Draft last season (Torrens, Smith, Tyler Jones, Tyler Webb) and all but Torrens were returned. Now that the 2017season is over, the crew at Baseball Prospectus is storming through their annual look at the top ten prospects (plus more) in each farm system. Yesterday they hit the Yankees. From what I can tell, the entire article is free. You don’t need a subscription to read the commentary. Both OF Clint Frazier and UTIL Tyler Wade exhausted their rookie eligibility this season, which is why they’re not in the top ten. Frazier exceeded the 130 at-bat rookie limit (he finished with 134) while Wade accrued too much service time. The rookie limit is 45 days outside the September roster expansion period. Wade finished with 50 such days, by my unofficial count. Anyway, some thoughts. 1. A year ago at this time the farm system was very position player heavy. The top four and six of the top nine prospects in the system were position players, per Baseball Prospectus. Six of my top eight were position players. Now Baseball Prospectus has seven pitchers among the top ten prospects in the organization. Furthermore, six prospects in the 11-20 range are pitchers as well. That’s a lot of quality arms! And the Yankees are going to need them too. Pitchers break down, they fail to develop a third pitch, etc. There are so many things that can derail development. Plus young pitching is the best currency in baseball. It can get you almost anything you want at the trade deadline. We could start to see the system strength shift from position players to pitchers earlier this year. Now this is damn close to a pitcher first farm system. 2. Speaking of pitchers, where’s RHP Jorge Guzman? He’s not mentioned in the Baseball Prospectus write-up at all. Not in the top ten, not in the next ten, nothing. In the comments it was explained the Yankees have a deep system and Guzman essentially got squeezed out by the numbers crunch, though I’m not sure I agree with him not being a top 20 prospect in the system. Heck, he’s in my top ten right now. When you have Medina in the top ten and RHP Roansy Contreras in the next ten, it’s tough to understand why Guzman isn’t there. He’s a more polished version of those guys, relatively speaking. Perhaps his age is the problem? Guzman will turn 22 in January and he’s yet to pitch in a full season league. That happens when you don’t sign until 18. I dunno. They don’t check IDs on the mound. If you can get outs, it doesn’t matter if you’re 21 or 31 or 41. Guzman’s stuff is as good as anyone’s in the system and he made great strides with his command and secondary pitches in 2017. Seems like a top ten prospect to me. 3. OF Pablo Olivares got some love. He’s been a little sleeper favorite of mine the last two years. The 19-year-old struggled in his quick stint with Low-A Charleston last season, but he .311/.420/.424 (149 wRC+) with 10.7% walks and 13.4% strikeouts in complex ball from 2016-17. Olivares is one of those guys who does a little of everything but nothing exceptionally well. “I project him to at least average across the board, led by a future 55 hit tool … (When) patient, he took walks and drove pitches to center and oppo. He’s bigger than his listed 6-foot, 160 pounds (likely closer to 170), and while just an average runner, his reads and instincts in center are good enough to stick with an average arm. With maturity and some added strength, he at least has a chance to see 50 power,” said the write-up, which included Olivares as a prospect in the 11-20 range of the farm system. I like him. I think he’ll establish himself as a no-doubt top 15 prospect in the system in 2018. There’s a “Thairo Estrada but an outfielder” quality to Olivares. 4. My favorite feature of Baseball Prospectus’ annual prospect write-ups are the “top talents 25 and under” lists. The ten best players in the organization no older than 25, basically. Straightforward, right? New York’s list has Aaron Judge, Gary Sanchez, and Luis Severino in the 1-2-3 spots in that order, then slide the top ten prospects behind them. Noticeably absent: Greg Bird. Hmmm. I assume the injuries are the reason Bird was omitted from the top 25 and under talents — “As per usual, his future outlook depends almost entirely on his health,” said the write-up — but even considering that, I still feel like he belongs in the top ten somewhere. Why would injuries knock Bird out of the top ten but not, say, Abreu? He had injury problems of his own this year and he’s never pitched above High-A. Bird is quite risky given his injury history. He’s also shown he can be a productive big leaguer when healthy. Not sure I agree with knocking him down the list below prospects, who themselves are inherently risky.